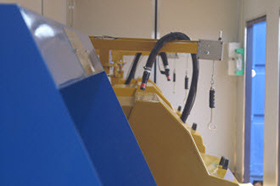 We are an experienced global supplier of end-to-end mine site laboratory solutions. We can take care of all your mine site laboratory needs, from laboratory design and installation, through to the supply of laboratory capital equipment and day to day consumables - no matter where in the world you are located. ILS is looking forward to the upcoming PDAC conference in Toronto. Once again we are at booth 1145 in the Trade Show South Hall. 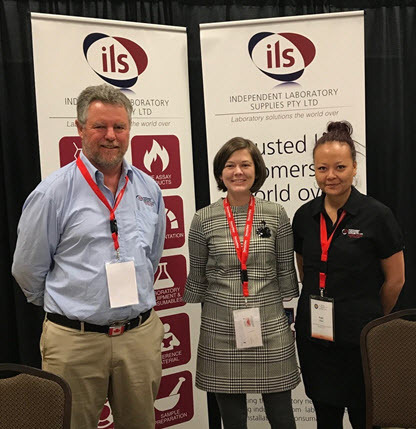 ILS will have representatives from both our Australian and Americas team on hand, so please feel free to come down and discuss your laboratory needs, or just to say hello. From inception, to design / modelling, equipment, supply and installation, ILS has been pleased to work on behalf of the client, to produce a first-class facility in the region. ILS continue to work hard for best results for our clients worldwide, often in challenging conditions and look forward to our upcoming projects. The ILS team were at the recent 49th Annual Canadian Mineral Analysis Conference in Kamloops. Our team were happy with the general upbeat vibe of this conference and were pleased to introduce clients to our new fully stocked warehouse in Sudbury, Ontario. Patricia Chia, from our Australian office was also over to lend a hand, and met with some of our longstanding clients. Tim Elliot made a presentation on the advantages of Leachwell / PAL machines for relevant mining and production applications, which was well received. We look forward to following up and servicing our Canadian client’s requirements. Our postal and contact details remain the same. streamlined offices and warehouse. The new ILS Headquarters! Once again ILS will have a booth in the PDAC conference in Toronto. We are at booth 1145 in the Trade Show South Hall. On hand, so please feel free to come down and discuss your laboratory needs, or just to say hello. This is the first year ILS has had a stand at the AME Roundup. The new ILS Americas office was represented at the Roundup by Tim Elliot and Leslie Clark. ”good feelings” toward the year ahead in our industry. 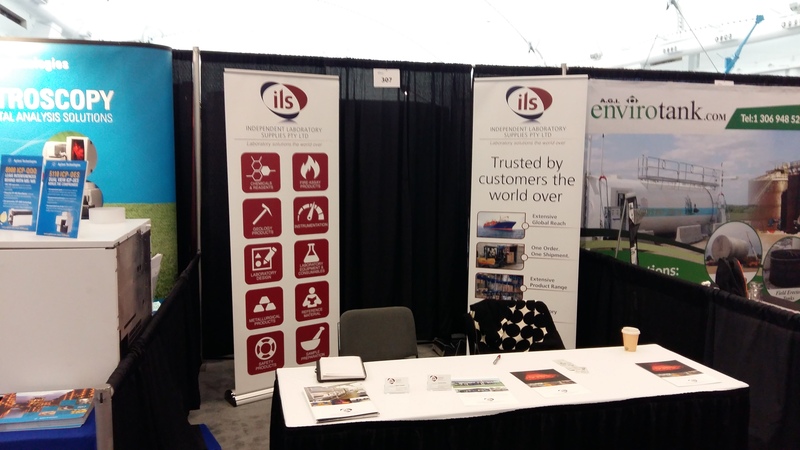 ILS has had its first display booth at this year's PDAC conference in Toronto. display and the 4 guys on the floor were kept busy with a consistent stream of enquiries. The general mood was very buoyant, despite the industry somewhat subdued at the moment. ILS look forward to display at this event again in 2016. 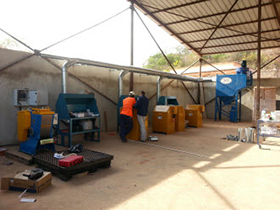 ILS completed the installation and commissioning of a full sample preparation facility in Guinea, West Africa. The facility was specifically designed for iron ore exploration sampling at a volume of 300 samples per day. The ILS chemist and electrician attended and oversaw the installation and commissioning of the facility. Being completed on time and on budget resulted in a very satisfied client. ILS completed the installation of a containerized sample preparation facility in a remote facility in Indonesia. 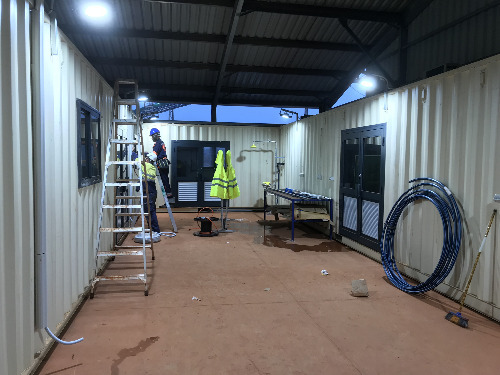 The exploration based facility consists of a twin 40 foot container style arrangement catering for bulk milling and the production of 300 samples per day. 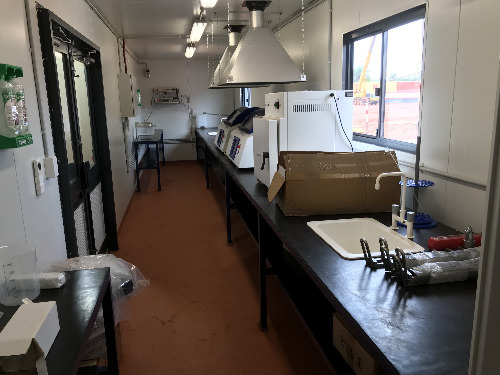 The containerized laboratory was built in the ILS warehouse in Western Australia, before being shipped to site. Logistics in this instance were a challenge, given the remoteness of the site and the lack of quality infrastructure, but ILS was able to complete its task as engaged.